The Milwaukee 11 amp Sawzall Reciprocating Saw is the most durable reciprocating saw on the market, and at only 7 pounds, it offers the best power to weight ratio in its class. 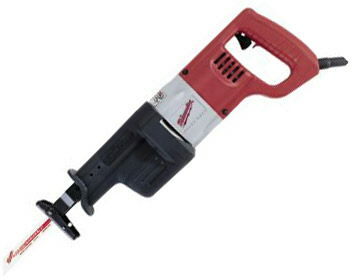 The saw offers a 0-2800 strokes per minute variable speed trigger with 3/4 in. stroke length and a Quik-Lok blade clamp for fast, tool-less blade changes. The rubber boot provides superior gripping, and the adjustable shoe provides longer blade life and more cut control. * Questions on our sawzall milwaukee rentals? Please call us!